A backyard pool is a place for families to play together as they cool off from the heat of the summer sun. Nevertheless, they also are a place filled with life-threatening dangers that can turn deadly in an instant. Each year, swimming pool accidents claim the lives of hundreds of children. Others are injured (some with permanent brain damage) due to prolonged submersion. If you have young children and a swimming pool in your backyard, the following pool safety tips will help to keep your children safe. Never leave a child unattended in the pool area. 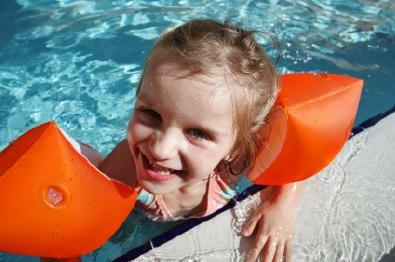 It is essential to provide constant supervision when a child is near a swimming pool. Make sure that babysitters and other child caregivers are aware of the possible dangers of the swimming pool. They need to know the importance of providing constant supervision to the child. Teach your children how to swim but never assume that because they know how to swim it is a safe to leave them in the pool unsupervised. Even if a child knows how to swim, he can still drown. All swimming pools need to be in an area that is completely fenced. Although some areas of the country have specific rules regarding the height of swimming pool safety fences, it should never be less than 42 inches high. If a pool fence has metal bars, they should be placed no more than 4 inches apart so a small child cannot squeeze through the bar spacings. If a chain-link or other type of mesh fence is used, the grids should be close together so a child cannot climb the fence. A self- closing and self-latching gate is an essential safety feature for a pool fence. This means that the fence gate swings closed and latches securely shut. This type of latch prevents the gate from ever being left open. Install the latch out of the reach of young children. Most people do not think of their pool cover as being a source of danger, yet children have become stuck underneath a partially removed pool cover and drowned. Whether you have an in-ground or above-ground backyard swimming pool, always completely remove the pool cover. Another area of pool safety that is often overlooked is the pool drain filtration system. In many states, anti-vortex main drain covers are mandated as a safety measure to stop children from becoming trapped by the suction of the drain. However, these drain covers do not have to be installed on pool drains in non-mandated states or on older pools in the states where they are mandated. The suction from the drain is strong enough to kill or mutilate a child. An added safeguard to anti-vortex pool drain covers is installing covers that are also anti-entrapment and anti-entanglement. This style drain cover eliminates the possibility of a child's fingers or hair getting sucked into the drain. A backyard pool is a great place to relax and enjoy family times swimming and playing in the water. Following backyard pool safety rules and precautions add to the security and protection you need to keep your family safe.